The last month or two I have been “forced” to look at X++ and AX2012, and getting started writing X++ is easy, if you have a background as a .NET developer. When you start writing and compiling code in AX, you quickly get frustrated as a .NET developer. Why does it not work, – my “compilation” did not throw any errors! It works when I run the job manually, but automatically I does not! So I realized that there was some fundamental AX2012 that I did not understand as a .NET developer, and much of the frustration was due not understand how the AX compiler works. For many (if not most!) developers this might not be a problem at all, or at least to at some point. In my case it was from the beginning. I will try to explain how I understand as a .NET developer how the X++ compiler and runtime execution works. 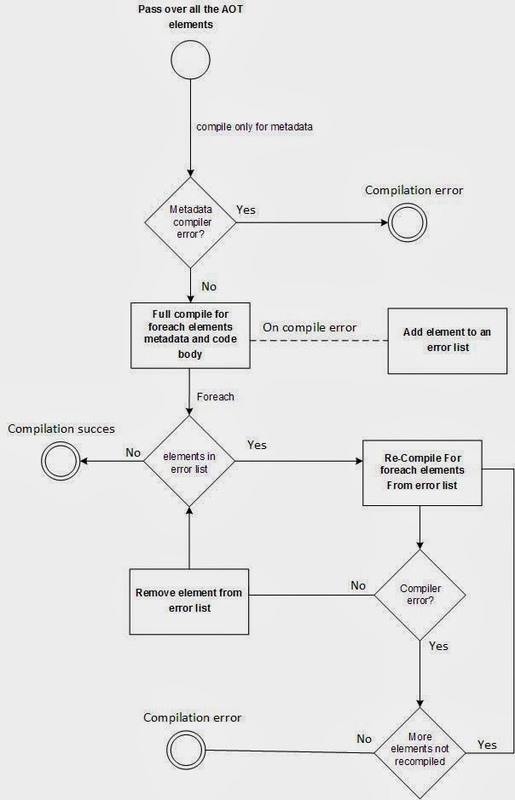 At a high level, the process of compiling and X++ is illustrated in this diagram. When you are compiling in AX, you don’t compile directly into .NET CIL, it only compiles to p-code. CIL is generated by actively choosing to generate it – either incrementally or full (full generation takes maybe 10-15 min). The Compilation results in P-code are stored in the model store (SQL database). Depending on the entry points your code will either be executed either directly in p-code or in CIL. From P-Code you can also easily switch to CIL execution – which is what the application does in most of the more complex proceses. However much code is still executed I P-Code. Phase2: Full compile for metadata and code bodies. Phase3 to PhaseN: Recompile the error elements, until success or error stabilization. First I show a diagram and next a good C# pseudo code example. So what is the different between p-code and CIL? In short: p-code is lazy regarding type-checking and CIL is strongly typed, the same way as when your C# code has been compiled to CIL. p-code is the byte code, which been compiled from X++ by the AX compiler. Batch jobs and the Business Connector always run in CIL code, and CIL can run on both the server, or the client. CIL runs on the CLR infrastructure, which is much faster than the interpreted p-code. The last thing I want to mention in this post is to be aware when using interpreted P-code. It has less restrictive type-checking at runtime than compiled with CIL, and this can cause your problems. I have probably found an AX bug where a method requiring a sub-type argument but actually getting a super-type instead. This can work fine in p-code, if the code is not calling something that is sub-type specific, but would give you and error in CIL because it’s strictly typed. And this will raise an “unable to cast the super-type to a sub-type”.